I can't claim to be a fan of the X-Factor, but I find it hard not to admire Simon Cowell's business acumen. He's taken a basic talent show formula and converted it into a series of television programs that are broadcast around the world. Just think about how simple the idea is: get a stage, ask people if they'd like to 'give it a go' and let the audience vote on who's the best. This scene has played out fifty million times in a million high schools. It's even been on TV in dozens of different guises. Cowell's success in the face of such familiarity demonstrates his genius. However, after a recent episode of the British X-Factor I wonder if he hasn't spread himself a little too thin. When Ceri Rees walked out on stage in the show that aired on September 18 it was obvious to anyone watching that this was a vulnerable woman, someone it would be easy to take advantage of. Her lack of self-knowledge instantly reminded me of Susan Boyle, only she didn't have Boyle's self-confidence. Or talent. No, Rees walked out on stage without the ability to stun people with an amazing voice. In fact, she couldn't sing a lick. The crowd laughed and sneered. Another similarity with the high school talent show is the how the X Factor crowd laughs joyously with the goofballs who are there just to show off and how the crowd laughs mockingly at those who don't realize they're no good. For that reason I don't really like these programs, but kids the world over do. The judges feigned concern for Rees as they let her know she hadn't made the grade. Before she came on stage a short clip told us that Rees had auditioned for the X Factor three other times over past six years. Each time she failed as miserably. What no one in the crowd or among the viewing audience knew then was that Rees was badgered to come back on by the program's producers. They deliberately went out of their way to ask her back in order to humiliate her. Her friends say she's been "in tears" ever since they rejected her again. Her singing coach, who gives Rees free lessons, says she called the producers after the program was recorded and asked them not to broadcast Rees's audition. They didn't bother listening. Rees is an adult and even if I and others feel she's vulnerable she has the right to make her own decisions. However, if the show's producers pestered her into returning she might well have believed her moment had come. You want to call it bullying? Go ahead. It's definitely cruel whatever it is and I hope the government authorities that control television licensing have a good look at this incident. If they're going to control TV they may as well start with this sort of thing. And where was Simon Cowell in all of this? Well, he was in America preparing for the American X Factor. I actually doubt Cowell would have allowed that clip to be broadcast because it damages the X Factor brand, something he's worked hard to build. Do I think he's too scrupulous to have used/abused a contestant like this? No, of course not, but I do think he'd have seen the danger to his business interests in actually summoning a person like Rees to humiliate them rather than just waiting for them to come to him. That's why I think Cowell is spread too thin. He's gone to America and left in charge people with the same exploitative instinct, but not the nose for business that he has. 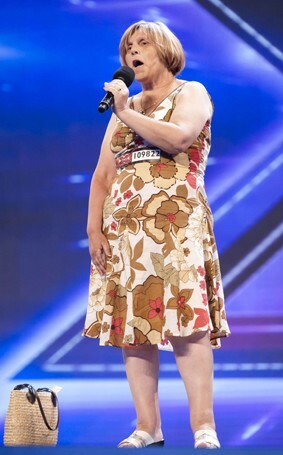 Basically, Cowell's left the schoolkids in charge of his talent show. He may pay a price for that.